I am sooooo excited to announce my next cruise which will be March 6-13, 2011 to Honduras/Beliz/Cozumel on the Royal Caribbean Voyager Ship leaving out of Galveston, TX. I will not be traveling to teach during the 2011 year, but this offer was just too wonderful to pass up. 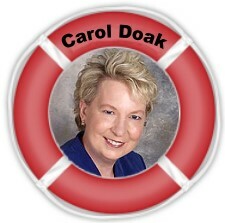 Although I announced this trip in my latest newsletter and to my Carol Doak Yahoo Group, I thought it would be fun to discuss what it is like to go on a quilting cruise. I am often asked about what it is like to go on a quilting cruise when I travel to teach. I have done several and although the exact format depends upon the group organizing the cruise there are common aspects. The entire ship is not full of quilting cruisers. 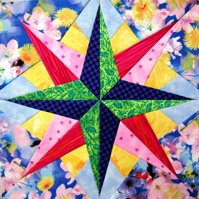 The number of quilters in the group range from approximately 50 to 250. Sometimes, it is the quilter and a friend, or a husband or a family member. The classes are typically held only on the days at sea, so the days in port and the evenings are always available to be spent with your traveling companion. Quilters also come on the trip without companions and the organizers can often match you up with another single traveler to share a room. What makes the quilting cruises fun is that you will be part of a group. Typically there is some sort of a meet and greet event and depending up the ship and group the dinner meal has the group all eating in one area of the dining area. So although you may go your separate ways on the days in port, you will meet up again at dinner time. This can be pretty flexible. The dinner clothing often scares people away from cruising. This has really relaxed quite a bit over the years. Most nights it is “smart casual” which just means show up in something respectable such as slacks and a blouse. On the formal nights (typically 2 nights), that means a cocktail dress or something a little dressier than smart casual. If you wore a black skirt and shell, that would be fine. As I wrote before, it has really relaxed in recent years. As for the classes, there are conference style rooms on the larger ships and this is typically where classes are held. On some cruises, handwork classes with fewer students might be held in a stateroom. Some of the cruises do supply sewing machines (typically supplied by a shop) for the cruise. This cruise will supply sewing machines. This eliminates you having to bring a machine. This has been the case on all the cruises that I have taught on. Some have kits available for purchase. This cruise will have a kit available for the classes. On your down time on ship you can take advantage of all the ship has to offer such as the evening entertainment, the spa, the pool, the library, the casino, the shops, and the list goes on and on. I had actually never been on a cruise prior to teaching on my first Caribbean Cruise and I discovered I loved it! First, the ships are large and you really don’t feel like you are on a ship. Except, having your morning cup of coffee on the a chair sitting out on the deck looking at the beautiful blue water and the sun rising is so relaxing. The food is fabulous…trust me…the food is fabulous…And you become part of a wonderful group of quilters that gets to play together for a full week! How much you connect with the others in the group is purely up to you. I found that I loved getting to know the others on the cruise and sometimes we made plans to go together on shore excursions. Deciding where the ship is going and when is also a factor. I live in NH so going on a March cruise where the weather will be warm is a real plus for me. 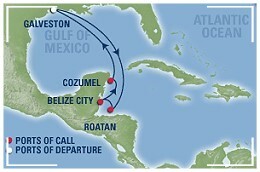 Also, as soon as I heard this cruise was going to Belize, I was in! I have wanted to travel there for several years. Leaving out of Galveston makes it an easy port to get to and that is another plus. If you want to read more about the details of this particular cruise, just click on this link and tell them Carol sent you…we will leave the light on. If you have a specific question that I have not answered, please feel free to email me at qcarol@comcast.net or post a comment here. Hope to meet some of you on the high seas! This entry was posted on Friday, October 2nd, 2009 at 1:48 pm and is filed under On The Road Again.... You can follow any responses to this entry through the RSS 2.0 feed. Both comments and pings are currently closed.